For this weeks Waiting On Wednesday I chose Perfect Ruin by Lauren DeStefano. 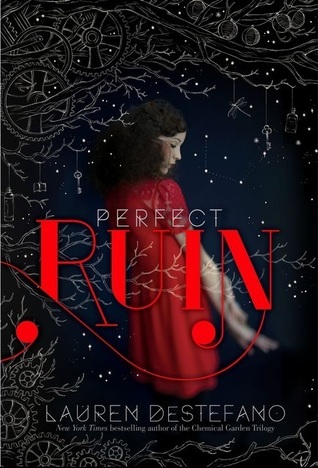 To put it simply Perfect Ruin just sounds like a damn awesome book not to mention it has such an absolutely stunning cover. As soon as I heard about this book I knew it was one that I would want to read. It's like a Dystopian Jetsons lol. Plus it is Lauren DeStefano so I know I'll like the writing. Since I'm curious, Have you heard of Perfect Ruin before? Will you be picking this up when it releases in October? Have you read Lauren DeStefano's other series? I liked The Chemical Garden series so I'm excited to check this one out! Plus living on the floating island in the clouds just sounds intriguing! Like I said it reminds me of the Jetsons in a way. Oooh... this is a new one to me!! Love the cover... Great Wow!! Heh, Dystopian Jetsons. I like that. :) I'm waiting on this one, too. A floating island sounds all kinds of awesome. Great pick and thanks for sharing! I haven't read her Chemical Garden trilogy yet; however, I also like the sound of PERFECT RUIN. The idea of a utopia instead of a dystopia really interests me! Also, re: your comment on my blog - Yes, I know CRUEL BEAUTY is on Edelweiss. I already got it. (; Thanks for stopping by! Oh nice!! Then I look forward to your review. i couldn't really get into destefano's chemical garden series. but i keep seeing this book everywhere and every time i do, i want to read it more and more. I've seen this one around a lot, and I'm excited for it! I haven't read her Chemical Garden series, and I've heard mixed things about it. But I agree with you--this book sounds awesome! SUCH a pretty cover! And dystopian Jetsons, haha!! Yup, pretty much sums it up. Oh yes I want to check this out-I haven't finished the Chemical Gardens series yet but I hope to this summer and then I'll be ready for this new series.